Master Coale’s Pieces (1978) is a four-movement suite for piano written for Samuel Coale, who visited Burgess in Monaco in the summer of 1978 to gather information for a book about his work. 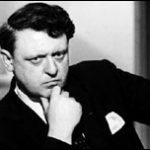 Coale’s monograph Anthony Burgess was published by Ungar in 1981, and his interviews with Burgess are collected in Conversations With Anthony Burgess, edited by Earl G. and Mary C. Ingersoll and published by Mississippi University Press in 2008. These short piano works are humourous and playful, and have unexpected echoes of Bartok and Hindemith. A ‘maggotte’, which is the name of the final piece of the suite, is a name for an old English country dance tune, often named for a dedicatee as here.